I have recently decided to host a Mad Men party set for a weekend in July. I had been thinking about it for some time and after a friend urged me to hold one, I finally decided to do it! Though our 750 sq ft apartment is not the most ideal location for such an event, I have figured out some the details in advance. My boyfriend and I have already discussed the types of liquor we'll have displayed-- I'm on the hunt for some vintage decanters like the ones shown in Mad Men. I have also decided to begin purchasing 60s barware in which guests can keep their glass as a party favor. I will definitely be taking photos of guests and posting them as soon as the party is finished! I will also be adding more party details as the time goes on. Have any Mad Men party ideas? Share them with a comment below! Oh darn! 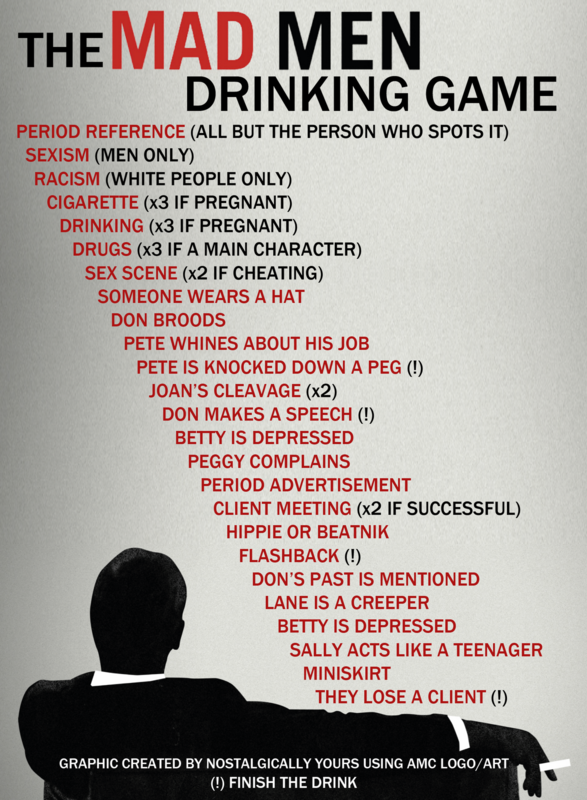 I had a MAD MEN party last September and this would have come in handy! So bummed. Maybe I'll just have to have another! Yes, definitely have another! I'm so excited-- I love planning parties, especially themed ones! I'm going to be daring and attempt to dress up as Joan. I found a lovely woman on Etsy who creates custom "pen necklaces" like the one Joan wears so much on the show.